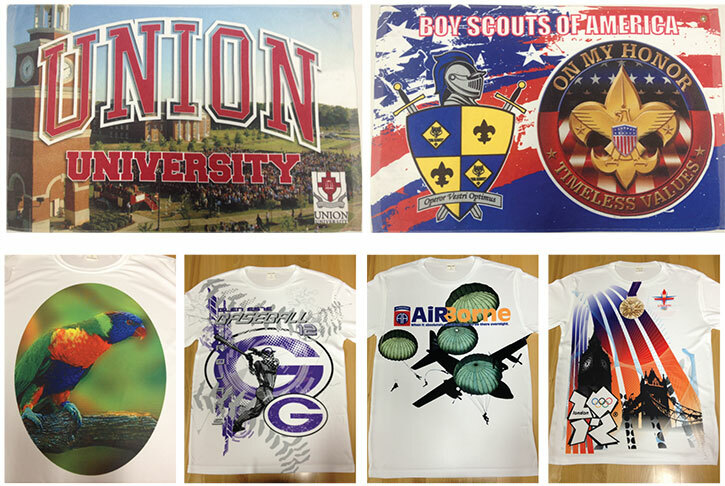 Sublimation printing uses heat sensitive inks to dye fabric. Unlike traditional inks, sublimation ink penetrates into fabrics and bonds directly with the material. The result is a vibrant and photo-realistic image that won’t fade or wash away. The maximum size we can sublimate is 60” wide by 40” tall. This is large enough to cover all apparel and most beach towels or throw blankets. Please contact us direcly for pricing. Sublimation is the most flexible decorating medium we have for artwork. We can use any artwork file as long as the resolution is acceptable at the size we are making the print. Vector artwork and high resolution JPGS (minimum of 150 DPI) are both acceptable artwork formats. SubliVie – 4.5oz 100% Poly line of tshirts. Carried by S&S Activewear and Alphabroder. Jerzee’s 21M 5.3oz 100% Poly. Carried by SanMar. Vapor Apparel’s Basic Collection. 5.9 oz 100% Poly. We will sublimate other 100% poly or 50/50 blends at your request. However, we will not be responsible for any yellowing of the fabric that occurs due to heat, blue spots that appear as a result of lint in the fabric, or sublimation color inconsistency that results from the fabric being less than ideal for sublimation purposes. Sublimation ink has absolutely no feel or “hand” to the ink. This makes it ideal for athletic or running apparel. Colors printed on white fabrics will be as bright or brighter than any other decorating method. Sublimation printing is not limited by the number of colors. Sublimation images can be hundreds of colors as easily as just a few. Sublimation printing is made for polyester fabrics. 50/50 garments can be used but they will have a much more faded look as compared to 100% polyester fabrics. Cotton fabrics do not sublimate at all. Sublimation inks are transparent. Any color to the fabric being sublimated will impact the colors of the image. White is the preferred fabric color to sublimate.